Just a new little inspiration I've been working on..A couple of years ago I created Merry Mitts and ever since, I have been working on making it even better. And by George, I think I've finally got it! I started with infusing a blend of my finest oils with my favorite skin soothing herbs ~ calendula, echinacea, rosemary, lavender & comfrey. Most of which, I grow myself and always using organic growing methods. 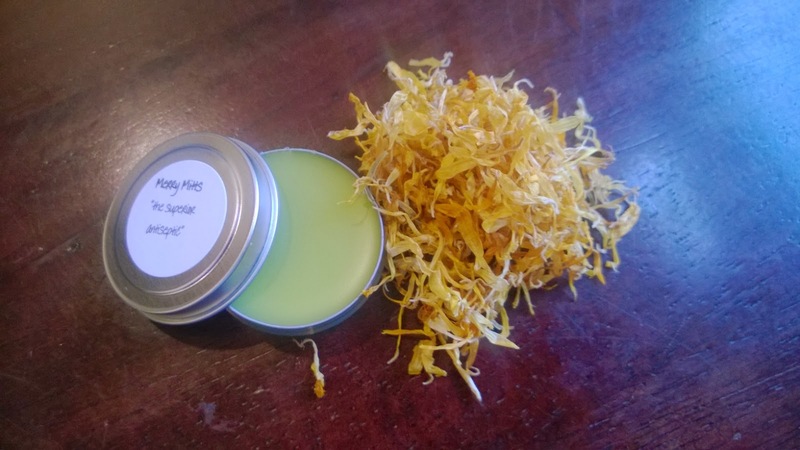 I've also added the healing essential oils of myrrh & tea tree and then finally put in the necessary naturally collected beeswax and the organic african shea butter to create the balm like consistency I'm looking for. It also contains vitamin E and grapefruit seed extract to improve and prolong its natural shelf life. Each tin weighs approximately .5ounces.